hotels and progressed to managing director position. He knows exactly what is required when it comes to catering for your guests. 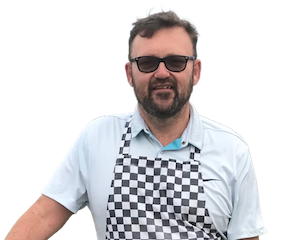 Quality driven, Peter works with you to ensure your event is well catered for, whether its’ a home dinner party or a wedding function for many. Peter is a Caterer at heart with a passion to help you succeed with your event. Providing catering for all types of events for business, weddings, and occasions of different sizes. The catering facilities are situated at the North Cliff Golf club in Scarborough. The club catering has a varied selection of foods for golfers. Menus include breakfast, lunches and evening meals for the members and guests. Peter’s long experience in the catering industry shows when managing large and small events for his clients. The catering team is friendly and helpful and you can be sure your event will be done right. where to eat out in our dining room at the North Cliff golf club venue or helps you when ordering food from our selection of catering services. The hygiene standards scheme gives you information about kirby catering’s hygiene standards. You can check kirby catering food hygiene rating online. Peter is always striving for higher standards, that’s why customers keep coming back for more.